After a bit of a lull on this blog, and with the long Winter evenings heading our way, perhaps it's time to pick up the needles again. Whippetsgalore and I decided to take an activity holiday with Skylark Holidays. 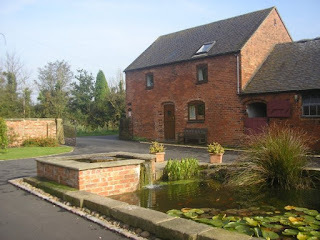 They offer self-catering and B&B accommodation and tuition in a range of activities. The accommodation couldn't be more attractive. This is the Chop House at Willington, Derbyshire. It's beautiful inside and extremely comfortable. Our tutor for the weekend was the lovely and very talented Alison Daykin. Here she's demonstrating spinning on her wheel. 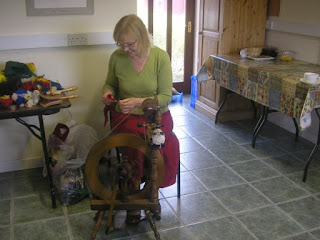 We started the weekend by learning how to select and wash a fleece, and then began to spin using a drop-spindle. It's a very simple, inexpensive and effective device. 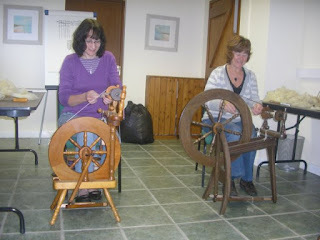 We finished the first day by learning to use a treadle spinning wheel. The gentle, almost hypnotic rhythm of the treadle and simple action of drawing the fleece make this a very relaxing hobby. Here are some of the results of our labours! I hadn't expected to produce very much yarn (though I had taken some needles with me just in case!) but even using the drop-spindle, the yarn grows quite quickly. 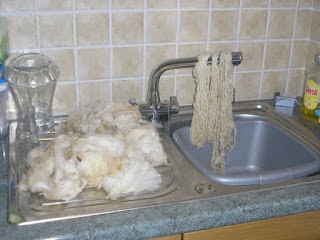 The fleece on the drainer is some that we washed at the start of the day, and the yarn hung over the tap is that which we made using the drop-spindle on the first day. This young lady belongs to a friend of Mum, who was kind enough to give us some of the fleece from her sheep. You can't tell from the photo, but this raw fleece smells quite pungent. (They're not clean animals.) There are some lovely tones here, from black through brown to cream. 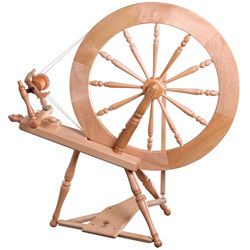 I've been practising using my drop-spindle, but I decided I'd love to have my own wheel. After just a short time I found this eBay bargain. I love my new wheel, though it will take some love and care before it's usable. It was listed as being 'for decorative purposes'. All moving parts move; some bits and pieces are missing or broken, but nothing that can't fairly easily be replaced or mended. It's dull and dirty, but I'll enjoy cleaning, oiling and polishing it. Some initial research (a lunchtime spent googling 'spinning wheel') told me that this is an upright design, or 'castle' design (on account of its looks). It's a double-drive and has a distaff (the tall vertical bit which goes way off the picture). This can be set to the left or the right and holds your fleece for you. I am so jealous! There is an alpaca farm near here that provides wool for spinners, but I don't know any local spinners, and certainly none that would teach me. You'll have to show us your wheel after you've got it functioning.